Home Knowledge F.A.Qs What is Side Ventilation? Do I Need it On My Polytunnel? What is Side Ventilation? Do I Need it On My Polytunnel? One of the decisions polytunnel purchasers will have to make when choosing their polytunnel is whether or not doors will provide adequate levels of ventilation for the structure. Where they do not, it may be necessary to consider purchasing a polytunnel with additional side ventilation. Side ventilation may also be considered by those with existing polytunnels who find that their current ventilation is not sufficient for their needs, or who have decided to use their polytunnel for a purpose other than that which was originally intended. Side ventilation is an extra option that can be added to a polytunnel structure. The side ventilation option consists of treated timber or aluminium rails added to the polytunnel structure at a height of around 3ft above ground level, from which a ventilation netting of 50% shade is hung. This shade netting can be trenched, or affixed to a base rail at the bottom of the structure. This depends on which method of construction has been chosen for the polytunnel in question. 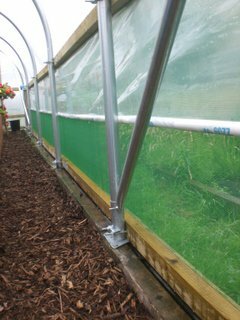 When a timber ventilation rail has been chosen, polytunnel owners also have the option of adding a polythene blind. This can be rolled down on the outside of the netting in order to close off the ventilation when this is required. This option can allow you more flexibility when it comes to choosing the amount of ventilation provided at any particular point in time. How much ventilation is required in a polytunnel will depend on what the polytunnel is being used for, as well as where it is located, and the climate experienced in the region. In the Highlands of Scotland, for example, you are likely to require less ventilation, as the polytunnel in this region is unlikely to experience the summer extremes of temperature that might be experienced in, for example, the south of England. Ventilation is one of the main means by which a polytunnel is cooled in the summer months. Keeping a polytunnel cool will be particularly important where it is used for livestock. Or in circumstances where temperate climate vegetables and fruits are grown. Those growing food in their polytunnels should also note that having enough ventilation is important in order to reduce the risk of disease. Disease can spread more quickly where inadequate ventilation causes high humidity and allows mildews and moulds to take hold. On very windy sites, or in exposed locations, however, having too much ventilation could also be a problem. Side ventilation can therefore usually only be a valid and valuable option where there is not a strong breeze or cross-wind. In such locations, side ventilation could reduce the protective value of the polytunnel. That said, in places where ventilation needs vary, side ventilation with the option of the polythene blind on the outside could be a good choice. This allows you to have more control over the level of ventilation that you maintain throughout the year. Should I Get Side Ventilation? Do you live in a warmer area where breezes may be limited in summer? Is your polytunnel in a particularly sheltered or very exposed spot? Will you have livestock in your polytunnel? Which plants will you be growing in your polytunnel and what are their ventilation/ temperature needs? Is keeping your polytunnel cool a problem in the summer, or are you more concerned with keeping it warm in the winter? Answering the above questions should help you to decide whether side ventilation is for you. Or whether you will find doors adequate for your ventilation needs. Check out our handy guides to learn more about maintaining good conditions in your polytunnel all year round. Previous Post Thinning Fruits on Fruit Trees To Maximise Harvest Next Post Mark Gatter visits First Tunnels Polytunnel. A polytunnel should always be given maximum ventilation by day during the summer. It is best to close up in the evening to keep the night temperature as high as possible. A large difference between day and night temperatures can cause problems – especially with tomatoes. On sunny days which are followed by frosty nights the tunnel should be ventilated by day but closed up an hour or so before the sun goes down. Any reason the vents are not available with aluminium base rails..? The reason I ask is that your construction video (6hrs in 6mins) seems to show vents with aluminum rails. Still trying to decide if we are after the vents on our planned tunnel.